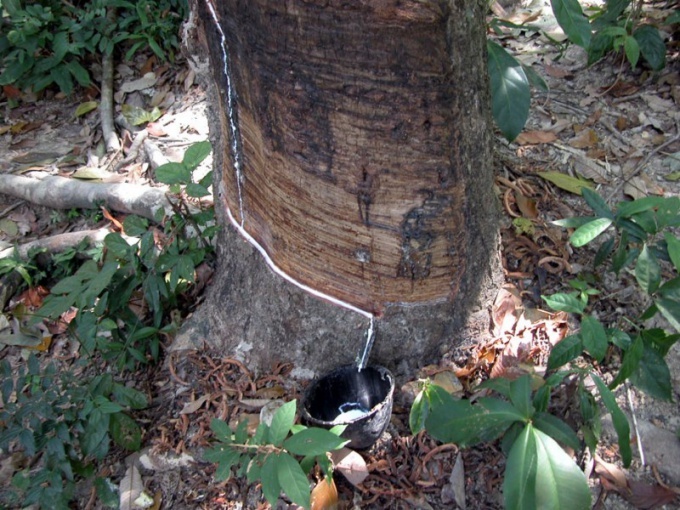 Latex is a processed SAP of the rubber tree hevea by the use of certain chemicals to impart required properties. This milky SAP is in the bark and in time damage the surface begins to emerge. Process it only in an industrial environment. As a rule, workers carefully cut the bark of the tree diagonally. The incision depth of 5 mm is slowly filled with white liquid. This resembling milk liquid is the future of latex. From each tree cut will flow approximately 50 g of juice. For one year cut the area of the cortex, which reaches a height of forty centimeters. Next year the cuts on the other site of the tree at this time is overgrown today. 5-6 years in this area the crust is completely renewed and it is possible again to collect useful liquid. The collection begins with the age of the rubber tree. The process of extracting latex lasts 2-3 hours, then the channels become clogged. Clots that occlude the channels, is also removed and used for preparation of low-grade rubbers. After harvested, the juice is converted into elastic rubber. It is filtered from impurities, for example, from the leaves, then the juice for 10 hours mixed with acid for hardening. Further, the future rubber is passed through rollers to remove excess acid and water. Then the mixture is ground, at this time, it resembles overcooked scrambled, then fired in a special huge ovens for 13 minutes. To latex has acquired great strength, it is subjected to vulcanization. It is exposed to a number of chemical reagents generally add sulfur. The result is an excellent raw material, which is material for the manufacture of elastic bandages, medical bandages, erasers, balloons, surgical gloves, antibacterial adhesive, some types of shoes and garments, catheters, condoms, teats, pacifiers, some items of sports equipment, massagers for your teeth, underwear elastic, paints, various masks, mattresses, pillows, and other.